Issa ToothbrushesI've heard of using silicone to enhance other parts of the human body, but a smile? Never. 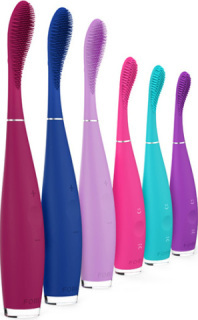 Foreo is changing that with their remarkable new silicone toothbrush, the Issa. Their innovation promises to whiten your teeth naturally, keep them clean, and give you a healthy mouth, which will make you want to smile even more. I think we've found the ultimate toothbrush. The Issa is made from soft silicone, which means it's gentle on teeth. Unlike stiff bristles in traditional toothbrushes, the Issa won't irritate your gums, cause gum recession, or bother sensitive teeth. Speaking as someone with sensitivity, I'm for it. The benefits go even farther. The Issa pulsates. High-intensity pulsations combined with silicone bristles make the Issa ultra efficient at removing stains on enamel. In addition, the natural properties in silicone create more friction that removes biofilm. You may have to explain this toothbrush to the TSA, but think of your teeth. Your teeth want this. The Issa is cleaner, too. It's nonporous and dries quickly to prevent bacteria buildup, and the silicone is easy to sterilize. No bacteria on your toothbrush means you'll have a healthier mouth. Also, if it has been more than twelve hours since you last brushed, the Issa lights up to remind you. On one hand, a reminder is nice, but on another, I worry that my toothbrush would be judging me. Foreo will release the Issa in Q2 of this year. Foreo says this will be the biggest revolution in dental care since 1952, and with all the benefits the Issa provides, I can understand why. However, based on the prices of other Foreo products, I'm assuming it's going to take a bite out of your wallet. It's a tough decision choosing between coin and a killer smile. Also, the head has to be replaced yearly and the battery only holds a charge for 365 uses, and after the 2-year warranty runs out, you'll be paying to replace all that on your own. Still, this toothbrush looks like it's from the future, so I say it's worth it. Be ready to grab one when Foreo releases the Issa. You can sign up to their mailing list here.